Drumfrochar, from the Gaelic “Druim Fhraochair”, Druim is a ridge, Fhraochair is thought to be a personal name. 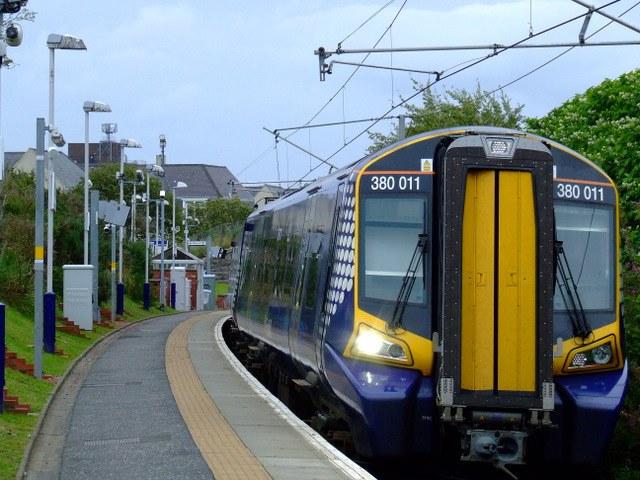 It’s claim to fame is that it is the newest station on the line – opened by Strathclyde Passenger Transport on 24 May 1998. The branch line to Wemyss Bay reaches its apex here. The station itself is a tight little halt on a curve in a cutting. The line then descends to Branchton on a succession of gradiants. The station, whilst rather unremarkable, does provide access to panoramic views over the River Clyde and the South West of Greenock. 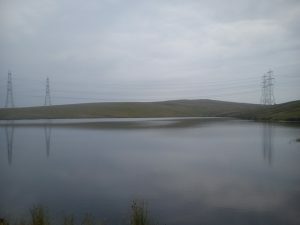 Probably Drumfrochar’s main attraction is as a starting and ending point for a circular walking route of 10.5km / 6.5 miles taking in the Greenock Cut, Loch Thom and the Old Largs Road. 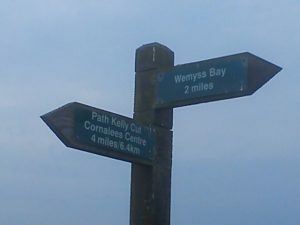 Access to the Kelly Cut can also take you on a longer walk to Wemyss Bay where you can catch the train back to Drumfrochar – a walking distance of 15km / 10 miles. The Greenock Cut once fed water from Loch Thom to Greenock for industrial and domestic use. It was built by Robert Thom, opened in 1827, and was replaced by a tunnel in 1971. A remarkable aqueduct designed by Robert Thom for the Shaws Water Company, fed from Loch Thom and several reservoirs. Early in the 19th Century, Greenock suffered a water shortage for consumption and to power the mills. Sir Michael Shaw Stewart engaged Robert Thom, who had done similar work on Bute for the Marquess of Bute, to improve Greenock’s water supply. The Loch Thom dam and the acqueduct were built between 1825 and 1827. The “Cut” is like a small canal and over its 4 mile length, falls only 30 feet. At its opening, Baillie Leitch sailed its entire length in an iron boat. In a series of 19 steps, each marked by a water-wheel powered mill, 2000hp was made available. 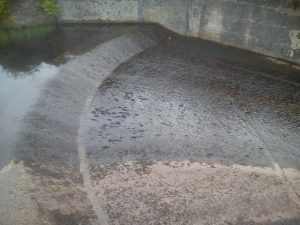 The Cut was used until 1971 when it was replaced by a 1.25 mile tunnel from Loch Thom to a dam at Overton. There are splendid views from the path alongside the Cut over the Clyde to Helensburgh and the Kyles of Bute. Leave Drumfrochar Station and walk uphill to the Overton Reservoir. The way should be signposted. 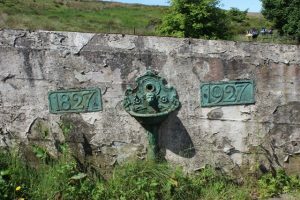 At the start of the Walk you will see the 1827-1927 centenary fountain. Follow the path to the side of this (not uphill) as this direction afford the best views of the Clyde Estuary, Cowal and Bute. The path is well constructed but maybe a bit rough for wheelchairs. Cyclists are asked not to use the route as it is a listed Ancient Monument. As well as the views there are various structures along the Cut. 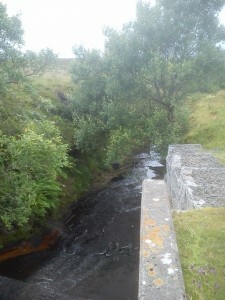 There are 23 bridges which afforded access to the moors for grazing, as well as bothies. 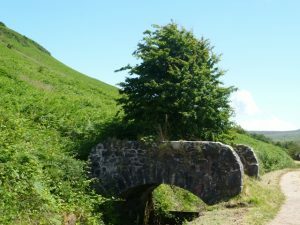 Bridges giving access to the moors – this one has a tree growing out of it! The Greenock Cut Walk ends at the Visitors’ Centre at Cornalees, where you can find out about the history of the Cut, buy souvenirs and enjoy some refreshments. Walkers have the choice to then head back to Greenock via the 4km / 2.5 mile Overton track, or to carry on to Wemyss Bay via the Kelly Cut. The Kelly Cut Walk takes the walker from Cornalees to the Kelly Reservoir via a moorland walk of 6.5 km / 4 miles. The Kelly Cut (aqueduct) was built in 1845 to provide additional water supplies to the Greenock Cut. 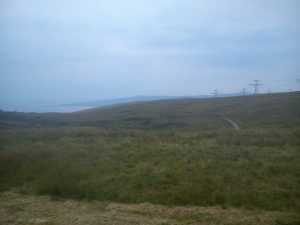 From the Kelly Reservoir, the walk continues to follow the Kelly Burn as it drops away down the hillside to meet the Clyde Estuary at Wemyss Bay. 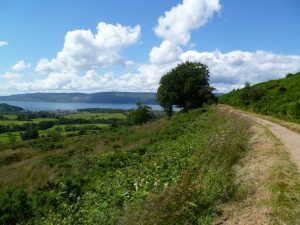 This 3 km / 2 mile walk takes the walker down past the Caravan Park and exits less than 200m from Wemyss Bay Station.